THE FARMHOUSE Somehow it's already week 4 of the One Room Challenge and I feel like we're sooo close, but still sooo far away from finishing our master bedroom. 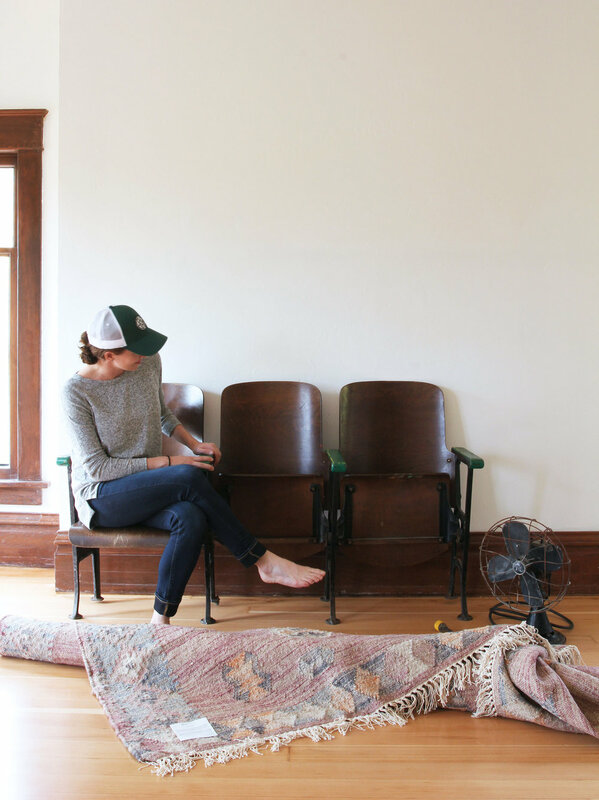 The walls are painted, the hardwood floors are refinished, the rug has arrived, and the vintage theater seats are here (plus a vintage fan, because we obviously needed one). But there's still the small matter of installing base shoe, wiring 2 sconces, hanging curtains, and finding art, night stands, a floor lamp, throw pillows, and all the little details that make a space feel homey. I really love my vintage theater chairs! And the best part is, they were only $25/seat. Getting a good deal is one of my greatest pleasures in life, so consider me thrilled! I still haven't decided if I'll leave the armrests green or sand them down and stain them, but it's likely to be a last minute decision once this space is a little farther along. The theater seats aren't actually installed yet since they need to be bolted to the floor, but I'm hoping to tackle that this weekend after we finalize their location. Speaking of floors, did you notice what's under the theater seats? Freshly redone hardwood floors! We spent the better part of 7 days refinishing our fir floors and they look so much better. I'm planning to share the process, pitfalls, and cost of refining our floors with you guys once we catch our breath, so stay tuned for that. But for now, I'm just appreciating these beautiful floors and loving that the steady stream of dust has finally stopped. Phew! For comparison's sake, here's what the floors used to look like after we pulled up the carpets, but before we started sanding. Better, right?! We chose not to stain our floors so they're this light, warm fir color. They will darken with age, which I'm excited about, but I'm also loving how they look right now, especially with my Skyline rug! I wanted to thank you guys for some really great feedback on last week's art roundup. Let me just say, Alison you are definitely right! She suggested that I give myself time to find the right piece of art and hang a mirror or tapestry there in the mean time. So smart, right?! I would hate to buy a piece of art that we don't love just to have something for the ORC reveal. I'll keep looking over the next two weeks, but I'm pretty sure that you'll see a mirror here instead of art when week 6 rolls around. Alright, that's all the progress I have to report today. Only two weeks of the One Room Challenge left. I am officially scrambling! Eeech! You can catch up on my previous One Room Challenge posts here: week 1 (before/design plan), week 2 (pulling up carpets/paint), and week 3 (hardwood progress/seats/art). Thanks for following along! p.s. John and Sherry talked about renovating with young kids in their most recent podcast and I loved what they had to say. Thank goodness John threw in the TV comment at the end or I was going to have to write an entire post on the powers of that magic black box during a renovation! p.p.p.s. How a 26-year-old CEO spends her money. My sister sent me this article and it's totally not what I expected. I'm sending a fist pump to you, Ms. Mah!